Come and enjoy the Community Fest in Kingston’s ancient market place. Try mouth-watering Korean food and watch various performances, such K-Dances, K-Music and Hapkido created by Koreans artists in collaboration with the local British artists (details below). The Community Fest will provide a variety of entertainment from Korea’s traditional to the latest culture with educational programms for everyone. The world premiere of Gilnori 2017 will starts the Fest with a big bang to give an insight of what is to come within the Fest. It represents an arts and environmental project called ‘Artrash’ from Korea to shares our concern about the environmental issues. 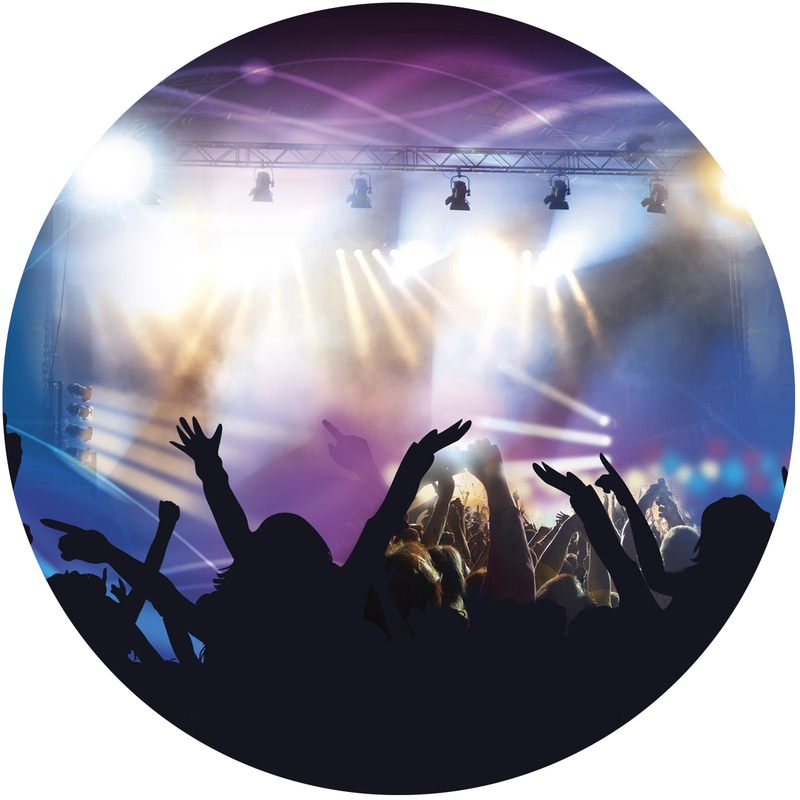 There will be numerous exciting audience participation programmes. One-year-old babies will be invited to experience Doljabee ceremony and there will be other programmes such as Korean folk game (Jaegichagi), paper flower and lantern making for families and children to enjoy. Children can try on traditional Korean costumes too! 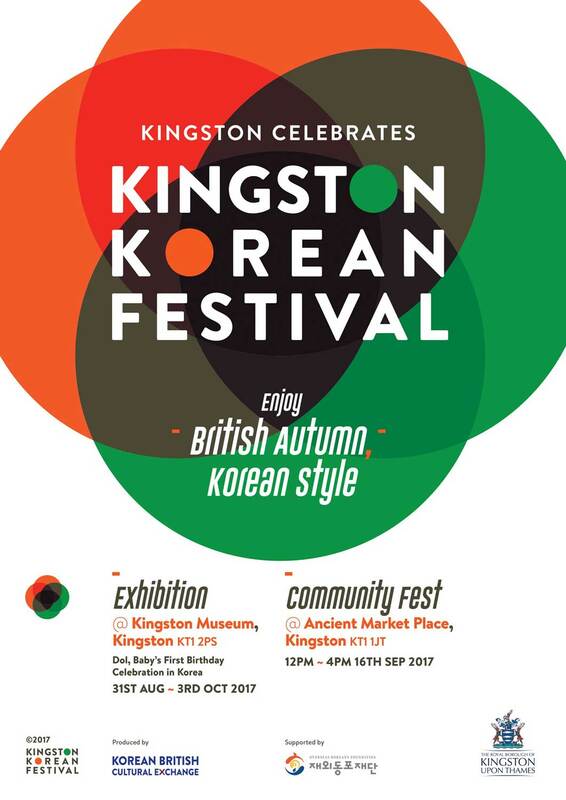 ‘Gilnori 2017’ will mark the opening of the 2017 Kingston Korean Festival. KBCE is turning Gilnori into a modern parade in collaboration with the location British artists to open the festival! 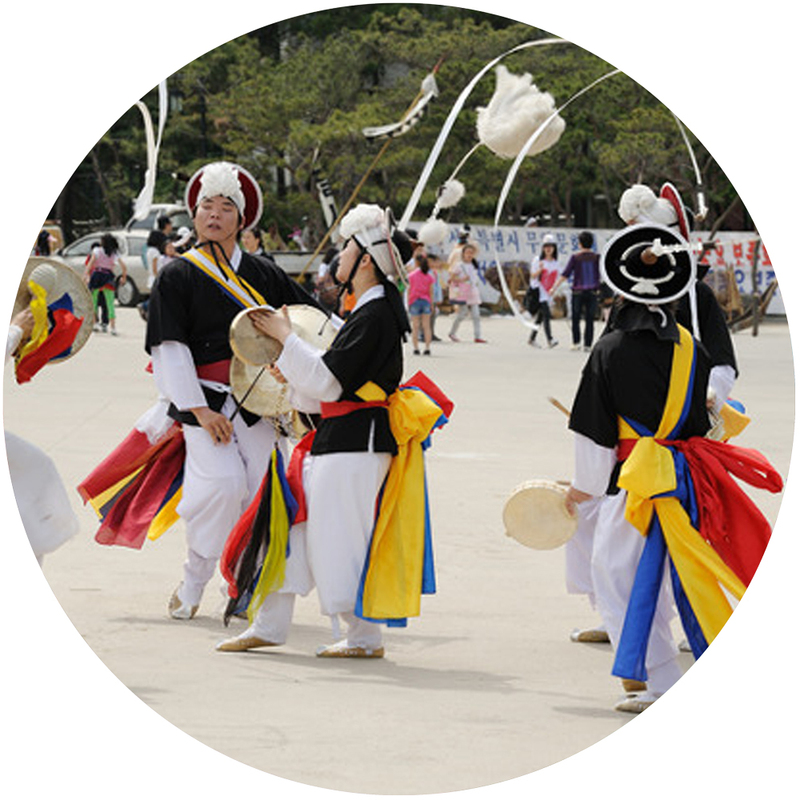 In Korea, artists at local festivals traditionally marched around the village playing and dancing to the music wearing masks prior to their performance. This was to attract and invite people to come along to their show or a festival. This is referred to as ‘Gilnori’ (meaning street performance in Korean) which was essentially a preview to give public an insight of what is to come. So this year KBCE have created our own version of Gilnori. We have been inspired by the traditional form of Gilnori but we are putting our unique twist to it! The parade music has been composed by combining Korean traditional music with modern electronic music and there will be new choreography created just for the parade. We have taken modern interpretation of Korean traditional form of art, incorporating both traditional and modern aspects of both Korean and British culture to create something new and memorable. Gilnori 2017 will be a unique performance for all generation to enjoy. Younger generation of Koreans living in London and the British teenagers have come together to created dance performances, dancing to Korean pop music (known as K-pop). There will be 3 distinctive programmes which will include dance performances along over 10 different K-pop songs. You will probably recognise many of the songs and choreographies as they will be taken from the original dance routine of the some of the very popular K-pop singers. So if you do recognise any of the dance moves, feel free to join in and dance to the beat! Furthermore, we will be introducing Korean traditional music with a modern twist by combining them with the K-pop music. They have been carefully constructed together to create an original piece of its own, creating catchy remixes. This may sound unusual as they are two very different style of music and famous in their own right for different reasons but you will be surprised to hear how great they sound together! There also will be a showcase of choreography specially created to match the rhythms of this new music so watch out for that too! It will be a unique experience for everyone of all age to enjoy. Mystic Nights Entertainment is a group of 15 performers consisting of dancers, singers and musicians. 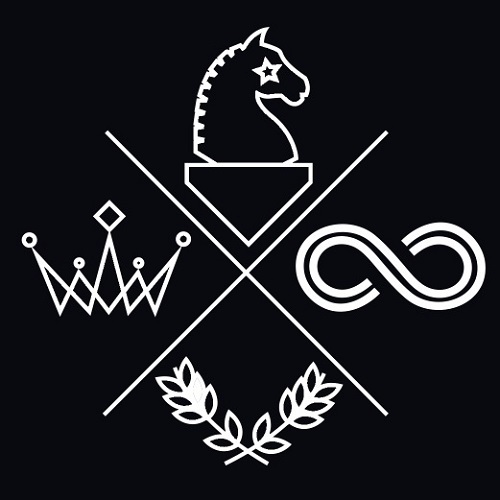 It is made of three distinctive performance groups, two of which are the team of dancers and a team of singers. Mystic Nights was established in 2013 and share strong team work even though one of the team is based in Indonesia. Mystic Nights specialises in choreography for music of all genres across different cultures given the group members’ ethnical diversity. Producer, Meligen is the working name for ML. His career has started in 2007 as a DJ. He plays and produces music of all genres and he specialises in Hip-hop. 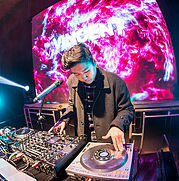 Since the start of his career, he has been working across various fields within the music industry. His experience includes working as a DJ, music producer, composer, arranger, record producer, recording engineer, mixing engineer, mastering engineer, music director and he also worked as a sound engineer for animations and movies. Gunmin Kim is an active member of ‘Artrash’ which is an Arts and Environmental project. He has been touring around Korea to promote the ‘Artrash since 2014. Gunmin as a singer and was inspired by folk and band music, especially 60’s British band music and UK artists. His style of music has been influenced by the UK artists such as Adele, Sam Smith, Birdy, Ed Sheeran. 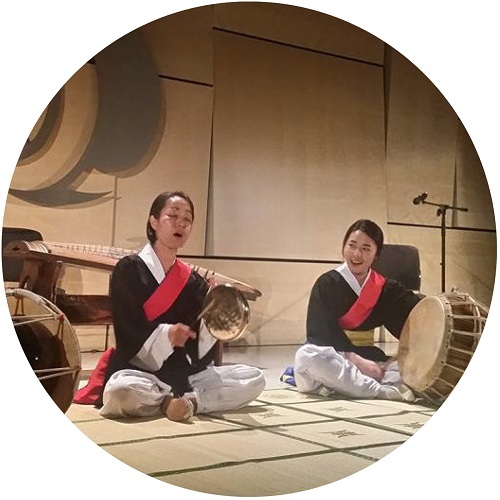 Samulnori is a Korean traditional genre of percussion music. The name comes from the fact that Samulnori is performed with four traditional Korean musical instruments as the word samul means “four objects” and nori means “play”. Bridge is Samulnori team which was created in 2010 with members who share their passion for Korean traditional music. 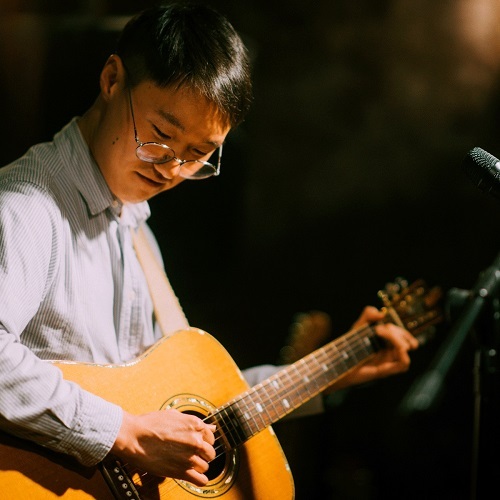 ts objective is to introduce the energy and joy that Samulnori exudes to the wider public and bring people from different cultures and backgrounds together by building a bridge between them through music. The gayageum is a traditional Korean string instrument with 12 strings and it is probably the best known traditional Korean musical instrument. 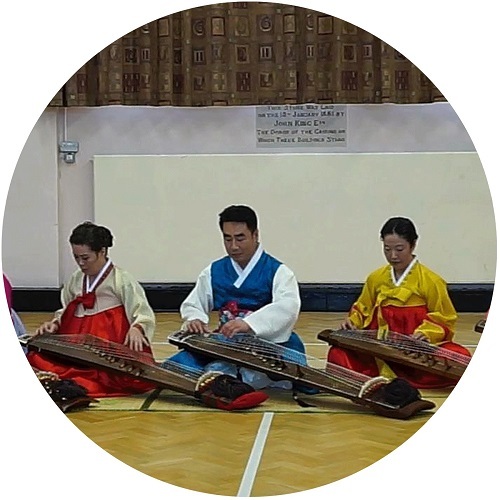 Gayageum ensemble, Arirang is a group of gayageum musicians based in the UK and have been performing in various events across London. Hapkido is a uniquely comprehensive ancient Korean art that is gaining a huge popularity around the world as a practical skill for self-defence. This is because Hapkido techniques do not require strength and, in conflict situations, they allow the defender to gain complete control with minimal effort without physical violence or injuries to the attacker. The art of Hapkido has the most varied types of techniques and offers extensive training in many disciplines, including correct breathing techniques, kicking techniques, pressure points, joint-locking, submissions, throwing techniques, weaponry (including the long staff, sword, cane, fan, short staff, middle staff, belt and rope), and falling techniques that are vital for self-protection in real-life situations. SKMA (School of Korean Martial Arts) is the authentic Korean Martial Arts School led by Korean Instructor, Master Daeman Sung (6th Dan Black belt and Ex Korean Special Forces). Our vast syllabus offers something for everyone – from those dedicated to mastering their abilities in a martial art, to those who simply want to keep fit. 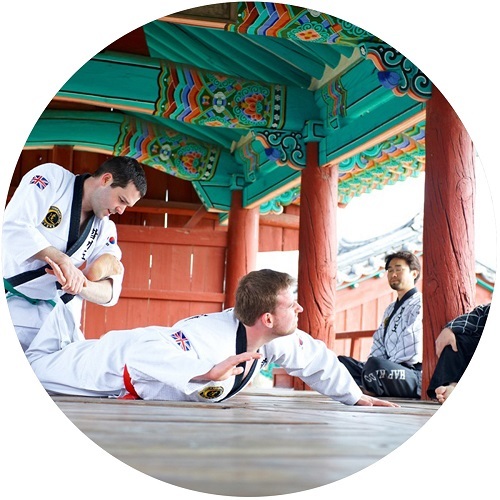 Courses run by SKMA include Hapkido, Yongmudo, Gumdo and Women’s self-defence. The syllabus is beneficial and ideal for every one of all ages and abilities. SKMA currently holds Martial Arts & Self-defence classes in, Wandsworth (London), Worcester Park (Surrey), New Haw (Surrey), Guildford (Surrey). Traditional Korean meals generally consist of a number of side dishes made from various ingredients that accompany steam-cooked short-grain rice. Kimchi is an essential part of Korean traditional meal and almost always served at every meal. Commonly used ingredients include sesame oil, doenjang (fermented bean paste), soy sauce, salt, garlic, ginger, pepper flakes, gochujang (fermented red chili paste) and cabbage. 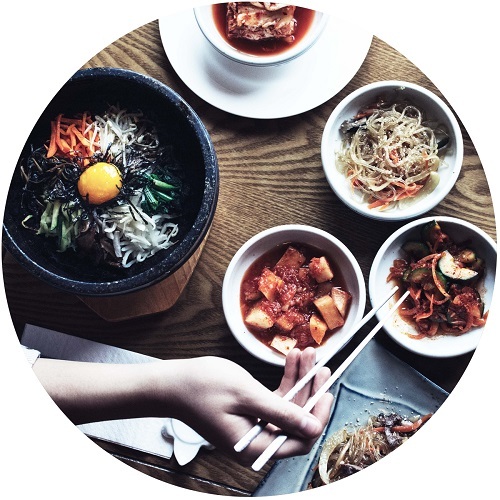 South Korean dishes are very different from western Foods in general, as there are a lot of side-dishes being served alongside the main dish. Hence the name ‘slide dishes’. The side dishes are to compliment the main dish. Sharky Yoon is the managing director of Mr.Kimchi and a Korean food developer in the UK. 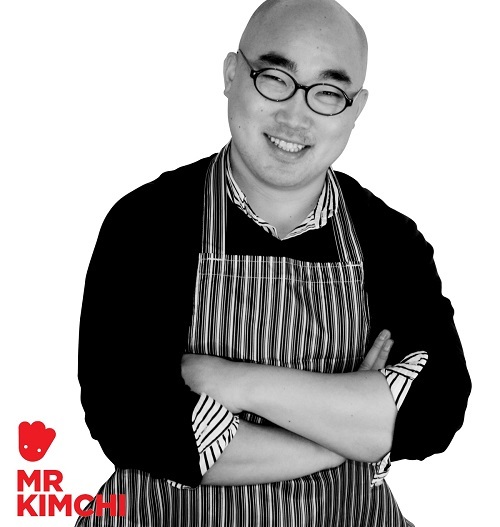 Mr. Kimchi is a premium Kimchi brand launched in 2013 and best known for providing customers with healthy, tasty and fresh kimchi in the UK. There will be boys and girls strutting down the catwalk wearing outfits made from recycledmaterials representing the collaboration of fashion and rubbish for the public to enjoy. ‘ArtTrash’ is created by a Korean artist, Seyoung Jang based in Gwanak-Gu, Seoul. The artistwill be working together with the Environmental Department of Kingston Council, which workstowards ‘waste 0’ Scheme. This show is to inspire the public to discover the beauty withinrubbish. These days, we are used to wasting so much and this show aims to raise publicawareness how rubbish can be recycled to create something beautiful and memorable. We encourage everyone to join us in this movement by collecting a piece of rubbish that they seethroughout the day and bring it along to the festival. Children are most welcome to join as theywill be able to use the rubbish as a token in exchange for face painting or one of the educationprogrammes on the day. Jegichagi is a Korean traditional outdoor game in which players kick a paper jegi into the air andattempt to keep it aloft using their feet. A jegi is similar to a shuttlecock, and is made from paperwrapped around a small coin. In Korea, children usually play alone or with friends in winterseasons, especially on Lunar New Year. Briefly explaining the rules, the player kicks a jegi up in the air and keeps on kicking to prevent it from falling to the ground. In a one-to- one game, a player with the most number of consecutive kicks wins. In a group game, the players stand in a circle, and take turns in kicking the Jegi. Players who fail to kick the jegi upon receiving it and let it drop to the ground lose. As a penalty,the loser tosses the jegi at the winner so that he can kick it as he wishes. When the loser catches the jegi back with his hands, the penalty ends and he can rejoin the game. This has developed,and people combined two or three materials and made new ways of playing jegichagi. Though the game was traditionally mostly played in winter, it has become a year-round game. Make a paper flower with tissue paper. Make a lotus lantern using a recycled cofffee cup and Korean paper. Since 2010, Beob Jeon, a Buddhist artist, has been a very active member of Korean Artist Association in the UK and participated in various exhibition in Korea and the UK. She won prize from Grand Art Exhibition of Korean Buddhism and has a license holder of painting of Cultural Assets Technician. There will a stall where children aged from 9 to 15 can dress themselves up in beautiful Hanbokand perhaps imagine what it would’ve been like to be Korean princess or the Kings for a day.There will also be a photo booth, where you and your friends can take memorable photos toshow off your Hanbok. Hanbok is the traditional attire of the Korean people, worn daily up until just 100 years ago.These days it is generally only worn on festive occasions or special anniversaries. Even though Hanbok is not worn on a daily basis anymore, Korean people have been increasingly wearing Hanbok for fun days out with friends and family especially when visiting Korean historic places such as the royal palaces. So you can say Hanbok is for everyone for whatever the occasion it might be. Families with a baby are welcome to come and experience the ‘Doljabee’ ceremony at thefestival. ‘Dol’ means baby’s first birthday in Korean which is traditionally marked as a big birthday year inKorea and ‘Doljabee’ is the main ceremony of Dol. For ‘Doljabee’, a ceremony table is prepared with various objects laid on it which symbolise different talents or skills. The birthday baby dressed in the Korean traditional costume (‘Hanbok’)is then invited to grab one of the objects presented on the ceremony table. The item chosen is said to predict the baby’s future.